One of the most popular tour packages in Bali is a tour of the Ubud area. There are some interesting places that are usually visited by tourists when driven by Bali transport with driver. One of the famous attractions is the village of Celuk. Many have known that Ubud is the center of art in Bali, and each village here has its own characteristic regarding of artworks. 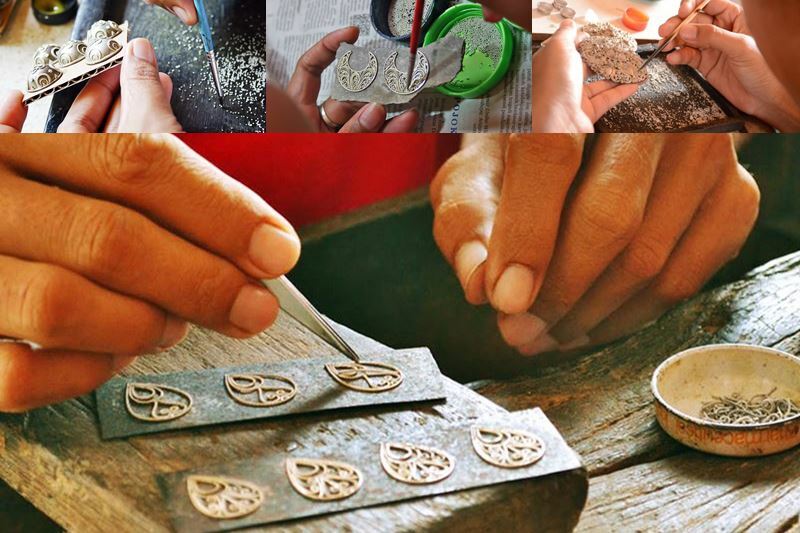 Celuk Village is one of a famous area in Ubud that becomes center of silverwork and gold. Here, there are numerous artists that produce jewelry and other works of art from silver and gold, all in delicate and detailed styles that become characteristics of Bali artworks. Come here if you have serious money to spend and high taste for silver and gold shopping. In Celuk Village, there are many items of silver and gold jewelry from various styles; there are traditional and modern style jewelry items. For those who love beautiful jewelry, this is the right place to look for the best jewelry items you can find in this Island of God. Originally, people in Celuk were mostly farmers. However, after 1970’s and the booming of art movements as well as tourism, many people learned the crafts of making silver and gold jewelry, and this became the main livelihood in this village. 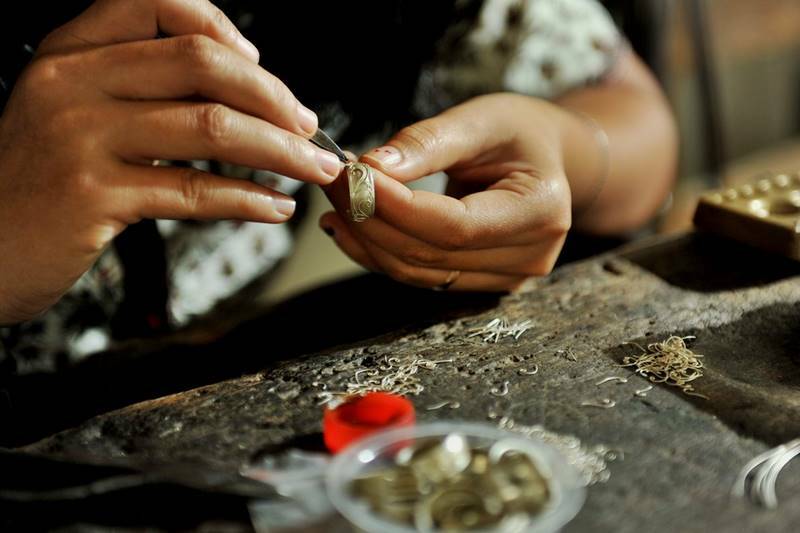 The first family that started this trend of making jewelry was Pande Clan, and until now, Celuk Village still becomes the famous center of gold and silverwork in Bali. Celuk Village is located in Ubud, and is a part of Gianyar Regency administrative. Celuk Village is not far from Mas Village, another art center that is famous for its wood carving. You can reach this village from central Ubud by using car in about 10 minutes. However, if you sign up for Ubud tour package from travel package, sometimes the route will also include both Mas and Celuk villages thanks to their reputations. In this village, you can stroll on the village road and see numerous jewelry stores and workshops, which all display beautiful gold and silver bracelets, pendants, earrings, anklets, brooches, hair pins, necklaces, rings and many more. All are very detailed and elegant, just like the common characteristics of Balinese art. You can also find several food stalls, supermarket and beverage sellers, as well as some galleries that sell serious works of arts. Some jewelry artists here are open for bargain, but there are also cheaper pieces if you are not really affluent. However, buying jewelry items in Celuk Village is a once in a lifetime opportunity to earn Bali authentic jewelry. Visit Celuk Village and indulge your eyes in shining, beautiful and elegant jewelry items from gold and silver, and do not be afraid of buying something as this may be a rare opportunity for you. If you are interested in visiting Celuk, please contact us for more information about Ubud tour.